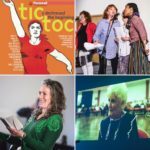 Get the Chance values the role playwrights living and working in Wales bring to the cultural life of our nation. Here is our first interview in this series with Welsh playwright Tony Wright. Hi Tony great to meet you, can you give our readers some background information on yourself please? Sure, so my name is Tony Wright my dad was Jamaican and my mum was Welsh and is from the Valleys. I grew in in Tremorfa, which is near to Splott in Cardiff. I left school without any formal qualifications. So what got you interested in writing then Tony? When I was 14 my sister brought a book home the Contender, it was a boxing book and this was the first book I picked up myself and was interested in. This developed an interest in literature for me so I then started to go to the library myself to read. Inspired by the book I tried boxing but it wasn’t really for me, it was too painful! That’s a great claim to fame! So what did you do then? Digital didn’t really take off and when I was about 30 I was offered the chance to access some adult education courses and went to the Friary and Coleg Glen Hafren in Cardiff I learnt during the adult education courses that I was dyslexic. I think dyslexia wasn’t as widely known then. My tutors informed me I should have had an A grades but because of my dyslexia I got a C’s, which made me really angry and frustrated. I continued to want to learn and managed to get to university and studied a combined studies course on Media, History and Cultural studies. Much of my studies were based on subcultures and Rude Boy culture. During the course I learnt about scriptwriting. Again my tutor informed me that they thought I had dyslexia. I had a test and was diagnosed with severe dyslexia. I realised I if I had have been diagnosed earlier I would have received support but I didn’t and still don’t let my dyslexia hold me back. To do that yourself takes a lot of drive and ambition Tony, did you approach the Arts Council of Wales or similar organisations for funding or support? Yes I went to Arts Council Wales for funding but I was unsuccessful in my application at the time, as I didn’t have 2 years trading or bank accounts. This was a barrier for me but they were flexible and asked to see if I had some evidence of trading. From then on we started to develop a relationship and discuss how they could support me. Since then I have had lots of support from ACW officers Jennifer Stoves, Melanie Hawthorn and Nick Davies. They know my work and me. So with the success of your first play I wonder if you then wanted to develop your play writing skills? 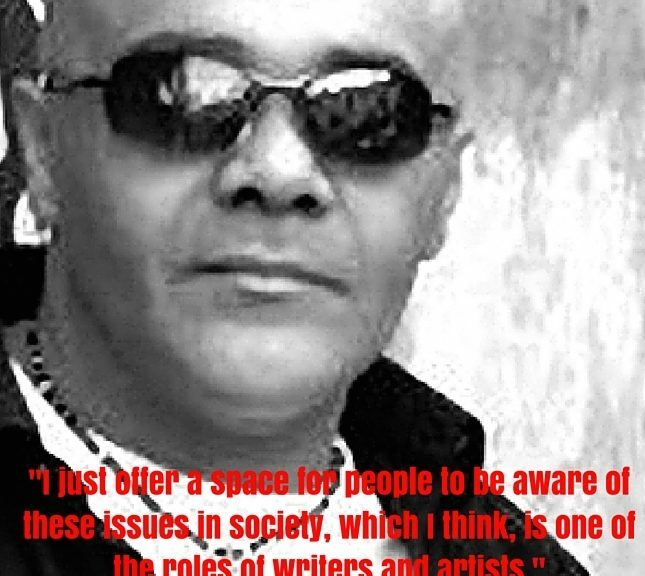 Well they say to write about what you know so… my next project developed out of my knowledge of Reggae sound systems and Rude Boy culture, music was and is the thing that brings lots of my friends together. 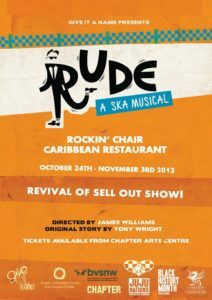 ‘Rude’ is became a Ska musical about a mixed race guy in Cardiff called Roddy, the play focus’ on him looking back at his teenage rude boy-self and the characters, culture and music that informed his youth. The project developed when I met with a guy called Dave Norton and James Williams. 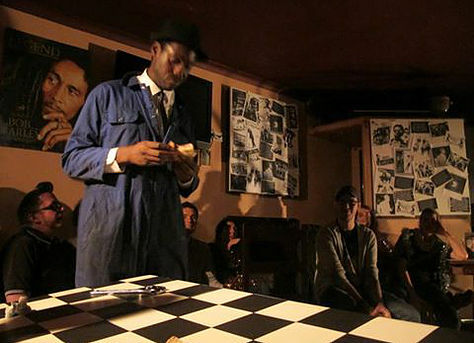 I met Dave in a bar and we got talking and I found out that Dave was an actor and producer with his own theatre company called ‘Give it a Name.’ We started working on it together in 2009 it was produced twice in 2009 and 2012, the second time as part of Black History Month. 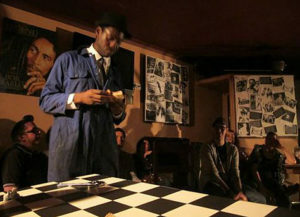 The play featured Shekira Johnson, Brent Morgan, John Norton, Dean Rehman, Joe Shire, and Olly Wood. James Williams who is a Musical Director was also the plays director. We performed it in the Rockin’ Chair Bar and Grill, in Riverside, Cardiff which was a Caribbean restaurant. Performing it there meant we took theatre into a place it’s not normally shown. It was all staged in the restaurant. There were people sitting eating and the play was happening around them. The actors improvised with the audience it was excellent. There was one part of the show where the cast pretend to fight and one of the local bouncers jumped in to stop the fight thinking it was real! We had to say, “No Dave mate it’s a play!” James also got the excellent band together. They were Jenny Bradley, Fran Dimech, Chay Lockyer, Eric Martin Jr, and Gregg Price. I love the fact that the production was performed in a restaurant and not a traditional theatre space and really involved the audience. So to bring us up to date what have you been up to recently? Well I am 53 I have been thinking to myself no more Art stuff. All my mates are retiring and I am thinking about getting a job! I started doing some voluntary work at Butetown History and Arts Centre and enjoyed meeting the different people that use the building. 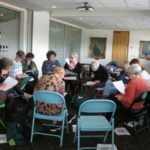 Whilst volunteering there I supported a project with MIND and a campaign called ‘Time to Change’ I was approached to work one project called Mental Notes – Beyond Words. 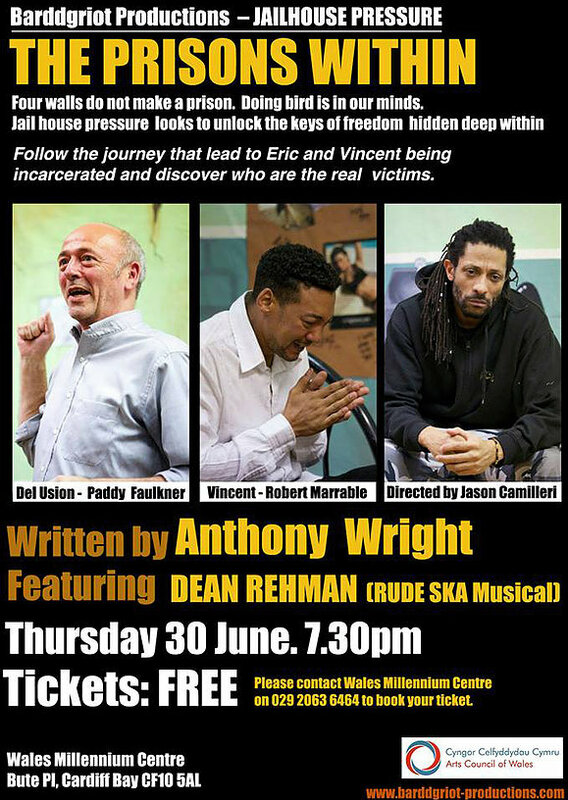 I developed a piece of drama called ‘The Prisons Within’ I personally know a lot of people who have gone to prison with mental health problems and the importance of getting help. 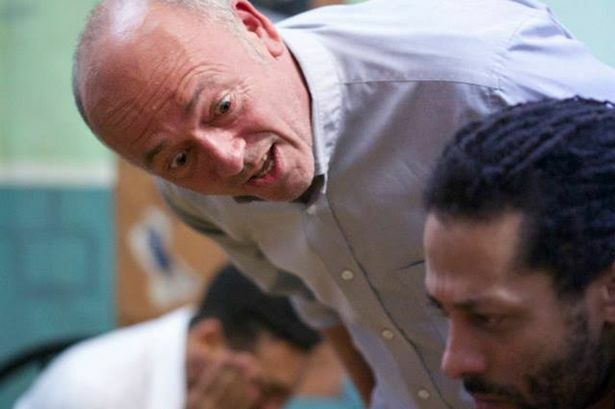 The play is set in a prison with two men in the same cell. In turns out one has OCD and one has depression. Del Lusion is one character and he is a symptom of mental health problems. He winds up the other character in the play. During the play the two characters get to know each other and talk about how they ended up in prison. 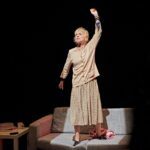 With the play I don’t offer any solutions to mental health problems I just offer a space for people to be aware of these issues in society, which I think, is one of the roles of writers and artists. Sounds great I believe the production is going to be staged again soon? When will we be able to see the production Tony? The play will be performed at The Wales Millennium Centre on Thursday the 30th June at 7.30 pm. The cast for this performance will include Jonny Hollywood/Robert Marrable and Paddy Faulkner. It will be directed by Jason Camilleri. The play will also be performed at Parc Prison, Bridgend as part of their staff training next month. One of the reasons I formed my company Barddgriot- Productios was to maintain working with a talented multi-cultural team of people living in and working in Wales. As I have mentioned I have had the pleasure of working with a wealth of talented people in my career. I have also been supported by people like Director Greg Cullen who directed a short play I wrote at the Royal Welsh College of Music and Drama. 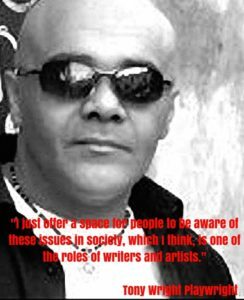 I hope to continue to work with more of the brilliant artists and writers in Wales in the future!